Reflective signs are normal real estate signs covered in a prismatic reflective material that reflects light at night. 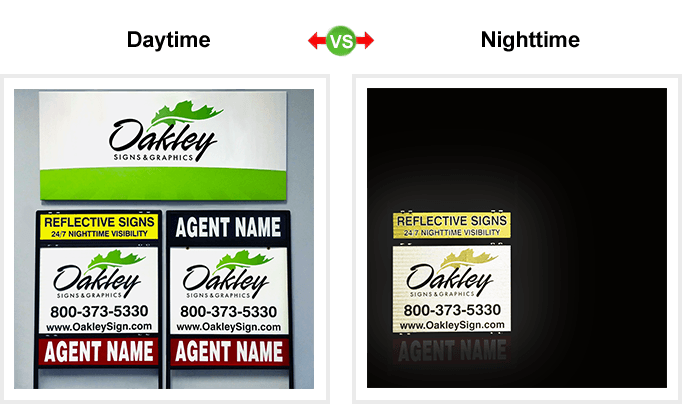 Reflective signs are the PREMIER signs in the real estate industry. How much of a difference does it make at night? You could say the difference is night and day! We use an industrial grade prismatic reflective coating from 3M. This is the same material that is used by the Department of Transportation on STOP signs, and in most conditions it will reflect light from up to 230 yards away. How durable are reflective signs? The 3M prismatic reflective coating has a lifespan of about 3-5 years. In addition, it also doubles the thickness of your signs. Most of our customers report that the reflective signs they order have outlasted their non-reflective signs by several years. What materials do you offer in reflective? All of the materials we offer are available in reflective, but we recommend reflective aluminum as the best value. Reflective aluminum is the most durable, longest lasting material that we offer. Does anyone actually shop for a home during dusk or at night? Yes - the majority of homebuyers drive by listings at dusk or night time. Most Americans are at work during daylight hours when non-reflective and reflective signs have equal visibility. These same people shop when reflective signs provide superior visibility. Are reflective signs right for me or my design? I've been having success without them. Reflective material will significantly enhance the visibility of any sign, no matter what the design is. It truly is a great way to take your marketing and signage to the next level. How many times have you wished that you had more hours in a day? Reflective signs give you those extra hours. Are reflective signs more expensive? As the premier option for real estate signs, reflective signs will be more expensive. However, that additional expense is far outweighed by the significant gain in visibility. Reflective material also improves the overall lifespan of signage, providing more bang for your buck. 93% of our customers that order reflective material order it again on their next order.